You have taken the Transition Trek, judiciously focused on images and the other psychic senses of the trek you have selected, and at the end although you are drowsy, you are still awake. As suggested before, you may wish to re-start your Transition Trek from the beginning or any place along it. If you have prepared in advance, you could start one of the other Transition Treks. These are certainly valid approaches. But you will probably run up against this situation at other times when you would rather go farther into the imaginative world instead of backtracking or jumping ship for another trek. The mental procedure I call “Chasing Hypnos” will allow you to do just that. Hypnos was the ancient Greek personification of sleep, and he can be illusive, as your problems getting to sleep testify. But as luck would have it, Hypnos has a family, and we might seek their help in finding him and getting him to lead us to Slumberland. This revealing observation gives us an opportunity to extend our interpretation of psychic phenomena and gain insight into what seem baffling experiences. Plus, knowledge and use of these aspects of the mythology of sleep help activate elements of our unconscious and prepare us for sleep because they allow us to focus on the sleep state. In doing so, we see into that dark world. The ancient Greeks had an entire mythology of sleep. They personified many aspects of that landscape, which help us understand some of its more important characteristics and relationships. But this ancient world is no child’s playground, as you will learn in Chapter 8 when I introduce more of the characters that occupy the landscape. Right now, we will need to identify only four: Nyx (Night), Hypnos (Sleep), Hermes (Bringer of Dreams) and the Tribe of Oneiroi (Dreams). Nyx is the mother of Hypnos. She is the most ancient and stood at the beginning of creation. She now resides in a cave where she gives oracles. This fact may be helpful since we ended two of our Transition Treks in a cave. The fourth character, Dreams, is personified as the Tribe of Oneiroi, and all of them are brothers of Hypnos. To make this work, you should do a little preparation as we did with the Transition Treks. In this case, you need to remember several of your own dreams, your Oneiroi. I recommend five, and they should all be positive in mood and content. No nightmares need apply. Since you couldn’t record your dreams with a camcorder as they occurred, you will have to record them with words as you remember them. Hopefully, you will already have done this for some of your more powerful dreams. If not, you will have to spend a few nights doing so. In the middle of trying to go to sleep, you don’t want to be struggling to remember a dream. Plus, your judicious selection will provide five positive ones at the ready. Your memory will flesh it out further if you need additional detail. If you have a recurring dream that isn’t a nightmare, you definitely should include it. You should read through your description of the five dreams before you go to bed, if you have been having difficulty getting to sleep during the Transition Trek, just in case. Just a quick word on why using previous dreams to get to sleep might work since we are in hypnagogia with the first REM state ninety minutes away. If you will remember back to Chapter 3 where we first discussed hypnagogia, some of the nine EEG wave states at times exhibited the properties of REM. People have also reported seeing phenomena resembling dreams during hypnagogia. Since it isn’t impossible to experience something reminiscent of dreams, it is worth a try. Early this morning, I woke from an unusual dream. I dreamt that I was on an expedition to another planet. We landed there and discovered evidence of life, an ancient but apparently extinct civilization. Everywhere we went we found indications that, at one time, ancient aliens had built and maintained a way of life there. A couple of us drifted off from the others, and when we rounded a hill, we looked off in the distance and saw a rather modern city, one that perhaps looked like America back in the 1950s. We saw cars stirring up dust as they zipped along dirt roads. When we got closer, we saw that they were teenagers out raising a ruckus in what appeared to be outdated American automobiles. When we came among them, we created quite a stir. They were excited to see us. They grabbed my companion and pulled him aboard what resembled a flatbed truck. They seemed similar to us, yet they were different, alien, and we couldn’t understand their language, at least not at first. I couldn’t understand how an alien civilization could possibly be so much like ours. But then I thought that perhaps some other, more advanced, civilization had abducted some Earthlings and deposited them on this distant planet to start a new civilization. But it also seemed that they had heard of our music and seen our movies. They somehow had a link to our communication stream, which explained their excitement at seeing us. I just woke from a dream of a dystopian world, a world where civilization and almost all the population were gone. Only a few people were left alive, but nothing bad was currently happening. I can’t remember if we were going anywhere in particular. We were just traveling. We were spending the night in a building close to a freeway. I don’t remember any trees, just roads and buildings. The front of the building, toward the freeway, seemed like a large room, perhaps the dining area of a restaurant. I remember that the front wall was mostly glass overlooking the freeway. I also remember bedrooms in the back where the rest of our traveling companions were sleeping. It was early morning, and we were getting ready to hit the road again. I wasn’t afraid, although I was concerned about strangers. There wasn’t any traffic to speak of on the freeway. Civilization was gone. What had happened to destroy civilization, I don’t know. It was early morning throughout the dream, the light before dawn. I don’t know who “we” were. I remember something about my older brother being there, or knowing he was there, but I don’t remember interacting with him. I believe my father was with us, or he came in during the night. I also remember asking if we’d had any visits from other travelers during the night, and he told me that we had three. One of them was apparently still there sleeping in one of the bedrooms. We could have been also traveling with a couple of my aunts and uncles. Close to the end of the dream, I remember my father saying people were still good to each other, or he didn’t say it but we knew it. He did say that everyone had predicted that people would be fighting and killing each other in such an unstructured world, but it wasn’t that way. I believe we did have guns, but I don’t remember having one myself. It was just the idea of guns that I remember. I dreamed about an old home that I lived in within which I had a lot of old items, some that were left to me and others of my own. An uncle came to the home and was going to destroy it and everything in it by burning it down. I said that I had to get the things out I wanted to keep. I had to hurry. I started removing some pieces of furniture and other loose items. My uncle started setting fire to the place while I was gathering my things. Once he started the fire, my dream ended. I dreamed that I was with a bunch of people who were giving me their condolences. I didn’t understand why. We were outside walking, and when we started to cross the street, I saw something lying in the gutter among leaves and other debris. It was a body, stripped of clothing, and when I went to see who it was, my friends tried to stop me, but I walked over to it anyway. It was lying under the front end of a parked car. The car hadn’t run over it. It was just lying there dead and discarded. By then I realized that it was me, my body. I felt great affection for it, and I was heartbroken that I was dead. I took a hold of my hand and moved my body around a bit, but I was dead. Dead, stiff and just simply discarded there at the side of the street. In the gutter. Under a car. But I had a new body and my friends wanted me to move on. I went into a home and went to a mirror to see what my new body looked like. I was surprised. I looked a little like a friend I had when I was in high school fifty-three years ago. I was not pleased, but at least I didn’t look horrible. It wasn’t as if I was reincarnated but more like I had just received a new body to replace the old one. It was not a traumatizing dream but not very pleasant either. I just woke from a dream. While visiting some acquaintances, I had a series of encounters where I got my feelings hurt, so I went to another area where I found my infant daughter. I picked her up and held her. I realized I hadn’t done that in while, and I missed her. She was perhaps six months old. I kissed her and hugged her. Then the scene shifted, and I was in the same house and still feeling hurt, but now a young oriental woman was there, and she said something that hurt my feelings also. Instead of leaving me alone, she started talking to me about what I was projecting. She said something about what she needed from me. She was quite pretty, slim and rather small. Quite beautiful, actually. She seemed to be a dancer, and she made a pose and asked me to interpret its mood. I made a guess, but I was wrong, and she continued to teach me with poses and movement. This young woman kept saying, “What I want from you is to focus just on the movement, the position.” She seemed to be telling me that I was projecting arrogance, which was also the way I was misinterpreting her actions. I still wasn’t getting it right when the dream ended. Okay, I realize that some of these dreams have aspects that are less than positive, but you should see what I had to select from. Sometimes dreams that are not positive have a seductive atmosphere. For example, Dream 5, during which the woman reprimanded me, left me with a good feeling just because of her interest in me. Dream 4 seemed to be about rebirth and had a puzzling positive effect although it was also about death — my own death and rebirth. The point is to pick dreams that you wish to re-experience, that will pull you in. Obviously, you cannot use my set of dreams as you probably do with my Transition Treks. 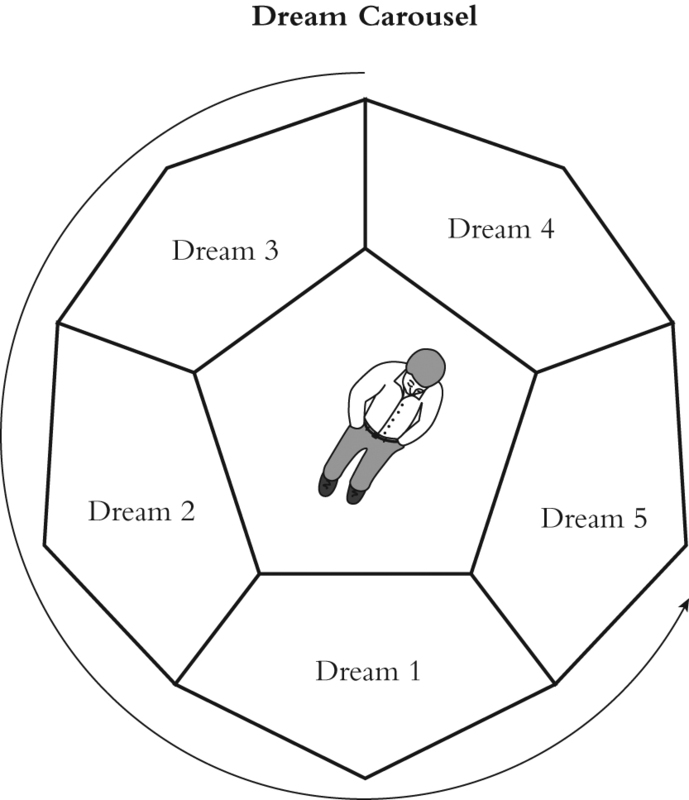 The purpose in using dreams is that they connect you to a previous personal REM sleep state. Also notice that I have listed my more recent dreams first. This is because they are fresher and should provide more direct contact with REM. Now we need to set up the scenario that will extend your Transition Trek. I call this “Chasing Hypnos,” and again it is written in first-person because you need to center yourself in the experience. This is written in much the same style as the Transition Treks, but I haven’t separated it into stages since this has to be envisioned as the final stage of hypnagogia. It has much the same characteristics as a short story, which is frequently called a “fictional dream.” But this fictional dream is based on that part of Greek mythology concerning Nyx and her offspring, as well as Hermes, who is Guide of Souls in the Underworld (Psychopompus) and the Bringer of Dreams (Oneiropompus). As before, memorize the images and experiences of your dreams, and once you have, put aside the words. You should only start this extension of the Transition Trek once you have failed to be fully asleep after executing a Transition Trek. If you have used the Castle or City of God treks, you are not situated in a cave at the end. If this discontinuity bothers you, you might use the Coastal or Mountain Descent Trek first, but you stand a good chance of never making it to Chasing Hypnos because you just might fall asleep. Not that that is a problem. You should also ensure you are still practicing sleep breathing when you start this method. I’m lying in bed having come to the end of my Transition Trek, but still not asleep. Then at the very edge of my mind, I think I hear voices. Slowly, I rise up and listen closer. Yes, I do hear voices, and they seem to be coming from deeper within the cave. No one ever goes there because it is a sacred place and forbidden unless you are called. But this voice does seem to be calling me. I crawl out of bed, slip on my sandals and make my way toward the back of the cave using the dim glow coming from farther inside. I push back the opening’s bearskin covering, enter a deeper cavern and feel a gust of fresh air. The voices have become louder, and I discover that the light emanates from a pale phosphorescence of the cave walls. I smell a woman’s perfume, just a slight but intoxicating scent. I round a corner, and there not far from me is a woman sitting on an elevated throne of modest size. She appears royal and dignified. An oddly dressed young man — winged cap and winged shoes — kneels at her feet. Seeing me, he rises and stands to her left. I thank her and fall in behind the young man, who has quickly moved toward an exit through a tunnel that becomes deeply dark, colder, and descends rapidly. I stumble forward. I feel a breath of fresh air, and then wind and realize that we have exited the cave. I am now on an open plane too dark to make out anything. Gradually my eyes adjust, and I see a world populated with strange beings, each with a pale aura that distinguishes them from a dark landscape of dead, leafless trees and the ruins of a once vast civilization. I see three centaurs conversing heatedly and a herd of unicorns grazing in a meadow nearby. I’m no longer certain I wish to sleep and would like to roam about this world exploring all its magnificent attractions. Seeing that I have been distracted, Hermes returns to drag me forward. “You are not safe here. This is not Slumberland,” he says. I see what he means. A fire-breathing dragon appears in the heavens, flying above and singeing the already crumbling and ashen landscape. I then remember that the unicorn has the reputation of being the fiercest animal alive. Still, I would like to linger among them. Hermes drags me forward into an area of deeper darkness that seems a refuge from that mythical realm. Finally, Hermes stops. I sense something before us, but I cannot tell what it is. He knocks on what sounds like a metal wall, and when a door creeks open allowing a pale glow to emanate, I realize that this is a bronze gate into a vast forbidden chamber, Tartarus. He converses briefly with a ghastly being that I wish I had never seen. The gate then closes only to reopen shortly with another ominous character emerging to close the bronze gate behind him but only after a stream of strange but rather familiar beings flows out with him. They form ranks around me, with Hermes taking my left arm and this other being, who can only be Hypnos, taking my right, and they drag me forward with the stream of familiar characters following behind. I can no longer see them without the light of the open gate, but I can hear them breathing and the sound of their clomping feet against cobblestones. They lead me off into a darkness so deep that my heart cries out for any light to break it. Both Hermes and Hypnos turn loose of me, and while Hypnos tosses up a spinning carousel of blank pentagonal surfaces, Hermes, with the motion of an arm reminiscent of a magician, teleports each of the familiar characters onto a separate surface. Then I realize that these characters, the Tribe of Oneiroi, are my dream characters. There is the dancing oriental woman who tried to teach me, and my uncle who burned the old home. Even one of the alien girls has joined us. These are my past dreams, and the images flash all around me. “You can enter any dream you wish,” Hypnos tells me. Each is interesting and begging me forward. I enter one knowing that on the other side of this dream is deep sleep. If that one doesn’t lead me to Slumberland, I will be able to transition into an adjacent one. I join the alien girl just as oblivion slowly overtakes me, and the next thing I know, it’s morning. Yes, I realize that with this little story I have violated all my previous dictates. It is a strange, violent, and for some at least a highly seductive world, not the bland landscape of our coastal Transition Trek. But here I’m more interested in bringing you into contact with startling images of the dream world. It is a different approach to solving the problem, insomnia. I have had to use this world to get to sleep a few times but only in the beginning of my sleep research. As I have said before, I now rarely make it off the beach of the Coastal Trek and only occasionally make it to the lake. I never come close to needing Chasing Hypnos, even though I would like to. Believe it or not, going to sleep using all these different treks, even what are supposed to be the boring ones, is an adventure, and I look forward to going to sleep each night and even hope to have a little trouble doing so. You select a dream to enter based purely on what you feel most comfortable with at the time. When you enter it, it repeats just as if it were a YouTube video. But you don’t simply view the dream. You relive it. You are the primary character in your dream the same way you were in the Transition Trek. Each dream contains images and other psychic senses that are peculiar to your experience. Once you enter the dream, you might be able to recover more specifics to identify with your psychic body. But you shouldn’t get overly intellectual about details. Remember that the only reason you have recalled the dream is to bring you closer to sleep. You may see different dreams than those you have chosen, and Hermes may even bring along new ones, throw you into REM, and off you will go to sleep. Let your mind float inside Slumberland and enjoy the sights until you enter deep sleep. Of course, the paramount action on your part is to focus on the images and make them as real as possible. But also focus part of your attention on sound and the other three senses. Get the dream to come alive. Since this Chasing Hypnos method involves dreams, the question then becomes, “Why can’t I skip the Transition Trek and Chasing Hypnos and start out with the Dream Carousel as soon as I hit the sheets?” And the answer is that you can. And if it works for you, that is great. However, when you first get in bed, you are not close to REM. That comes ninety minutes later. Plus, you haven’t prepared your mind by activating your psychic senses, the psychic body, for encountering your dreams. Yet, if it works for you, more power to you. In this particular scenario, Hermes is merely a facilitator. However, we do have a situation where Hermes is in his own element. That situation is when we have been asleep, just gone through REM and are at the very top of one of our sleep cycles. We start waking up when we wish we could just reenter sleep. This post-REM sleep region, if it can be called a region of sleep at all since you realize you are waking up, is called, as I mentioned before, hypnopompia. It deserves a short chapter all its own.